New Design Travel Lift Is High Quality Travel Lift! 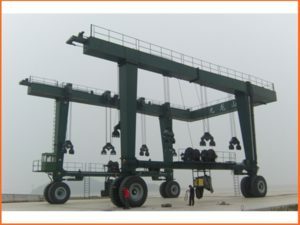 It has Remote Control Travel Lift Cabin Control Travel Lift Rubber Tyre Boat Hoist Crane! 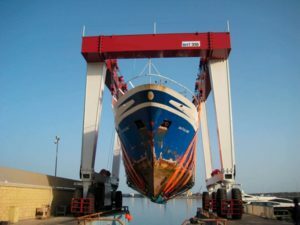 Best Choice For Vessel Lifting! New design travel lift refers to those advanced lifting crane. It is designed and produced according to practical needs and working conditions. 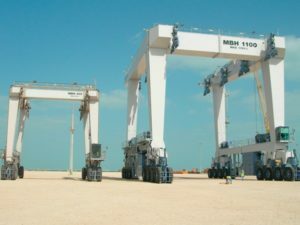 For example, this kind of gantry crane touches water frequently, thus its material is water-proof and corrosion-proof. New design travel hoist includes remote control travel lift, cabin control travel lift, and rubber tyre boat hoist crane, amphibious travel lift, straddle travel lift and all-wheel steering boat hoist. Ellsen, a famous travel lift manufacturer in China, supplies durable marine travel lift for sale. Affordable price! Top quality! Great performance! 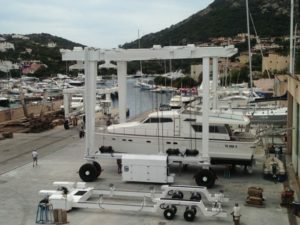 Buy Ellsen marine boat hoists for more benefits! New design boat hoist has terse structure, it is composed of lifting system, main steel frame, steering system, travelling system, power unit, pump station, electrical control system, and hydraulic transaction system. For travel system, there are four wheel groups, the total number is eight. They are industrial tyres. Each wheel group includes two wheels. The two rear wheel group is all driving wheels. And the front wheel group is designed as one driven wheel and one driving wheel. It means this travelling system includes six driving tyres and two driven tyres. For steering system, the crane is designed with four independent steering units, each steering unit includes the steering cylinder, bearing, and the electronic monitoring device and controlled by independent valve. Each wheel group can steel in 90 degree displacement and the steering angle is detecting by the sensors, the steering style of the travel lift include the carousel (rotation in the central point on itself), in diagonal direction, straight, transverse, etc. The auxiliary cylinder will jack up the wheel group when the wheel groups steering in carouse, which will reduce the tyre friction and increase the working life of the tyres. For lifting system, it includes the hydraulic winch, pulley blocks, wire rope, lifting belt, fixed and movable lifting point and load sensors.